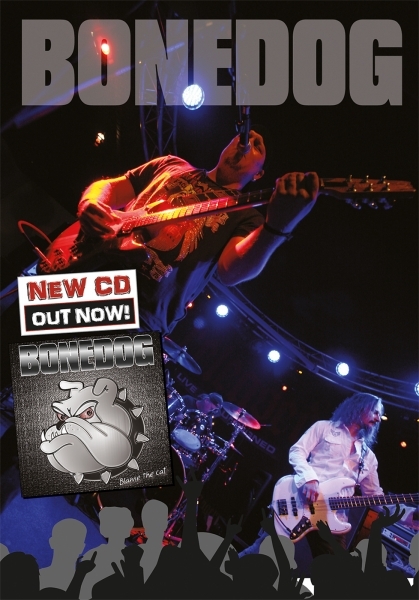 2011-03-24 01:53 - Bonedog "Blame the Cat" Debutalbum released! Bonedog participated in Released_Live_and_Unsigned_-_Helsingborg 20101106. Blame the Cat is their debutalbum. There is a touch of blues in most of the the songs. Influenses that can be heard is early Whitesnake, Stevie Ray Vaughn, ZZ-Top. The CD is a must have for anyone who likes bluesrock! Available at Tradebit, Jamster, Emusic, Amazon etc. Här kan du lyssna lite på varje låt. Klicka i artist och skriv Bonedog. Fint, kan man provlyssna på eran Myspace eller liknande?